“I counted all the gunshots in his chest one by one. Why did they shoot him? He was naked and waving with his hands pleading for their help to get medication for the injury he has been suffering from since the Battle of al-Furkan of 2008.” Said the mother of Issac Hassan a young man who was recently killed by an Egyptian soldier while scraping through the sea into the Egyptian territory. Sisi-led Egypt announced Gaza as a hostile entity and Hamas representatives were expelled from Egypt, whereas the Gazans has been ironically identified as enemies of the Republic of Egypt and as an imminent threat to the Egyptian national security. Lately Egypt’s ruling Generals have been trying to persuade Israel not to allow any Turkish empowerment in the Gaza Strip mainly after reconciliation talks between Turkey and Israel have surfaced. Turkey’s prerequisites to normalize relations with Israel and prioritizing lifting the blockade on Gaza apparently exasperated the Generals of Sisi’s regime. Palestinians believe that Egypt is working hard to topple any agreement that would ease the suffocating siege on their coastal enclave. Already, the Sisi-led Egypt has successfully managed to utterly destroy the “tunnels of life” between Egypt and Gaza and almost entirely lock the only border crossing to the Gazans. Hamas found herself entangled internally and regionally as she was plainly “quarantined” in undreamed-of ways while her mother Muslim Brotherhood Movement was in power 2 years ago. In the meanwhile, and due to the pressing challenges, Hamas’s politically endeavored to embrace reconciliation talks with the rival Palestinian Fatah Movement in the West Bank; nonetheless, all were efforts in vain. Hamas was literally driven to rekindle the relation with Iran after the apparent failure of finding a substitute funder or military logistics supplier to fill the Iranian void. Even with the risk that the Sunni world would predominantly abominate Hamas mainly after Iran’s sectarian involvement in Syria; Hamas channeled most of its attention to restore the strategic relation with the Republic of Iran turning a blind eye on the drastic rift of the Iranian foreign policies toward the whole region and the striking rapprochement between the Islamic Republic of Iran and the “Great Satan” US. Gaza has gone through horrible crises since Hamas was elected in 2006. Gaza has turned to be an unlivable place as it is well established to every living creature that there is no water, no electricity, no salaries, no food, no reconstruction, no hope, no life and the worst is that nobody can promise any change. Gaza is walking a tightrope with a combination of dilemmas rapidly depriving its residents from most basic of needs that would eventually lead to the eruption of the volcano. 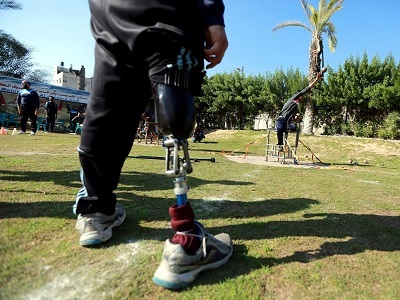 Both Gazans and Hamas are still staggering from the consequences of the last bloody war that claimed thousands of lives and left the Gaza Strip in rubble, where tens of thousands of people have been entirely displaced. Yet without any slim chances of change, Young Gazans prefer to die in the battle field not from hunger and diseases if the blockade of the Strip was not lifted. Since the outset of the third al-Aqsa intifada, tens of Gazans have been killed during clashes with Israeli occupation forces at Gaza’s eastern borders. Many of them called for Izz ad-Din al-Qassam Brigades to retaliate by re-firing rockets and mortars at Israel in response to Israel’s violations at al-Aqsa mosque. The course of events in the west bank and Jerusalem since the outbreak of the al-Aqsa third Intifada constitutes a safe exit to Hamas as the momentum of the “inspiring” stabbing attacks and vehicular run over operation would cover Hamas’ back and disperse Israel’s power in case a war broke out. Unlike the past war the West Bank and Jerusalem were paralyzed even to demonstrate or sympathize with the Gaza Strip. Hamas recognized that the strategic depth on any coming confrontation should flame the grounds of Jerusalem and the West Bank. Israel’s insolence pushed the Palestinian apolitical and non-partisan youths to stand up to Israeli’s violations and plans to demolish Islam’s third holiest shrine to build their alleged Temple Mount. Those young people are fully aware of the Palestinian Authority miserable conditions as it has been swamped by corruption, lug and indictments of squandering the public fund as recently auditors reported that approximately 40% of the budget had been vaguely shattered. This is at the time where most of those youths do live a state of incomprehension or rather an inclusive state of denial to the whole peace process and the boring cliché of “lasting peace” as they are still living an entirely different reality with Israel’s armed soldiers and settlers, roistering, storming, slaughtering and running wilder by burning babies. The Palestinians unwaveringly believe that more time is tantamount to more building of settlements in the West Bank and Jerusalem; as colonies’ number has tripled since Oslo. In the meanwhile, the Gazans are either displaced or confined in ghettoes or makeshift camps without electricity or basic needs of decent life, and in case they decide to move they will be dying on the Egyptian-Israeli barriers of disgrace and the gates of ignominy. Reality suggests that neither the democratic world nor Israel will abide to the basics of International Human Rights Laws when it comes to the Arab World in general and the Palestinians in Particular, all under the pretext of Israel’s security. These west democracies will keep unequivocally denying Palestinians their basic rights; nonetheless, they have to reckon that whatever trials they conduct to “tame the shrew” – Hamas – are doomed to failure. Hamas-Blair talks predestined to fail as it entailed the detachment of Gaza from the rest of the Palestinian cause. The West should consider the people’s choice and mustn’t exclude Hamas as she is the most influential player in the conflict. Ultimately, the evolving “inspiring attacks” in the Occupied Territory in addition to the continuation of Sisi-led Egypt obstructing serious promises, in case Turkey-Israel compromise achieved, to secure a floating port or at least alleviating the blockade on Gaza by allowing goods and materials access into the deserted enclave, will eventually enthuse the deprived and stranded Gazans to fight back whatever the consequences as far as they will belatedly die regardless of their choice. -2- Israel is a very different nation than the Nazi regime, which tried to starve the Ghetto to death, while Israel provides Gaza with food, water, medicine, and electricity. My heart hurts so much in frustration and anger at the Zionazis daily murder of my friends. Some help could be given by US allies but for the Israelis complete shut down of all entrances to Gaza and the other Occupied Territories.